The Do Book Company publish books designed to help you learn something new and motivate you to do it. Other books in their series include ‘Do Sourdough’, ‘Do improvise’ and ‘Do grow’. They gave me this book to review – one of the perks of being a beekeeper is you occasionally get free books about beekeeping! I was impressed when the book arrived, as it is beautifully laid out, with lots of colour photos, pencil drawings and recipes. It also has that fresh new book smell! 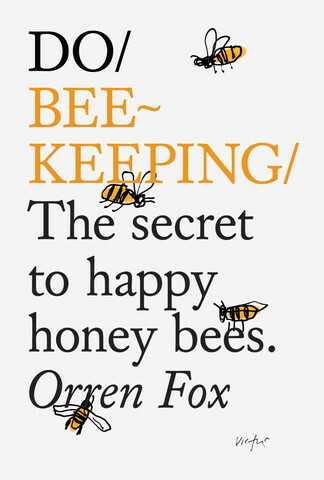 1) Orren Fox obviously has a huge amount of enthusiasm and love for bees. He has put that into the book so that the wonder of bees themselves takes centre stage. 2) He tells us lots of amusing and atmospheric beekeeping anecdotes which would give newbies an insight into what it’s like being a beekeeper. His writing is quite poetic, for instance his honey tastes like “apples, peaches and the Atlantic Ocean”. 3) Though Orren is from the U.S., effort has been put into updating the book for the British market, with references made to the UK notifiable diseases and bee inspectors. 4) The book has been well edited and spell-checked, with no obvious grammatical errors or typos (unlike some beekeeping books in my collection). It’s been professionally done and well put together. 5) There are practical and realistic tips, for instance Orren prepares his readers for bees being a money commitment which you might take a few years to earn back through honey sales. He also takes a gentle approach to his bees, carefully using a bee brush to move the bees out of the way before replacing boxes. There are some sections of the book which I feel are misleading, puzzling or omit important information. For example, page 15 says “The queen is rather easy to find in a hive due to her size”. Hmm, that must be why I have sometimes had to go through a hive multiple times before finding the queen amongst her 40,000+ daughters. Easy? I wish! She could do with being a bit bigger – perhaps the size of a hamster or even a small hedgehog. Page 16 says “Workers live for the smallest amount of time, just over a month” – this is true of the summer workers busy at their nursing and foraging duties, but not of autumn-born bees, who can live for several months through the winter until early spring. Page 33 says about wax foundation super frames that “they don’t last beyond one harvest, while the plastic sheets last for many seasons.” I don’t know what Orren is doing to his frames as most beekeepers I know use their drawn-out wax super frames for several years! Page 41 has a photo of blackened gauntlets – the most unhygienic gloves possible, which he admits have become gradually covered with propolis, wax and honey, so that his bees have become more and more attracted to them and cover his gloves during inspections. This doesn’t sound like a good thing! His hive tools also look like they could do with a good clean with some washing soda. This would make a nice present for someone interested in honey bees and who wants to find out more about what beekeeping is like. It’s a nice light read without getting too overwhelming; I can imagine a non-beekeeper reading it for pleasure – which I can’t say about Ted Hooper’s Guide to bees and honey, excellent though it is! It isn’t a book which a beginner could rely on to see them through their first season or that a more experienced beekeeper could learn anything new from. I say this because there is only one page on varroa mites and one on swarming. So a fun book for a non-beekeeper wanting to find out more about beekeeping, but not the only one they should read before getting bees! 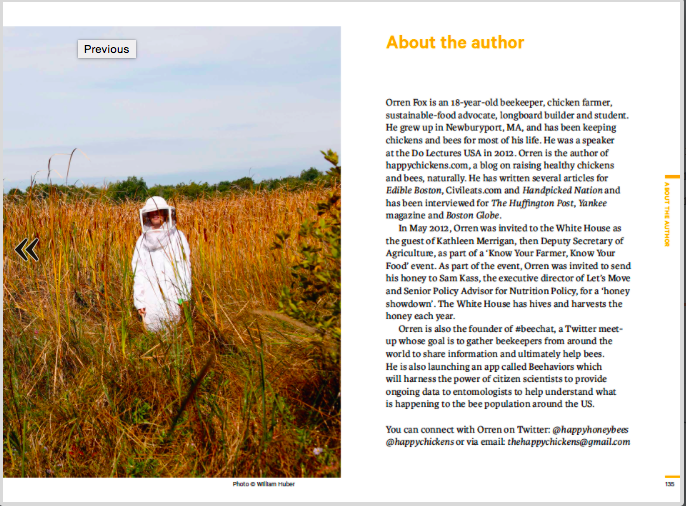 You can find Orren on Facebook, on Twitter at @happyhoneybees and on his blog at http://happychickenslayhealthyeggs.blogspot.co.uk – by the way he has a fascinating post about going beekeeping in Nepal. It sounds a bit like some of the cookery books about – nice to look at and quite informative but not much more?? Hi Philip, I think it’s deliberately intended to be a very general look at beekeeping rather than getting into the detailed nitty-gritty of it all. If he writes a second edition or another book I would like to hear more of Orren’s secrets! Thanks for the book review Emily! For new beeks my favourite books are the BBKA Guide to Beekeeping and the old standard, Storey’s Guide to Keeping Honey Bees. Like most beekeepers, I have a shelf of “how to beekeep” books and am always looking for a better one. And for that queen! I had a good chuckle at your retort on how easy she is to find. Hamster sized would be lovely! I have had a group of three very experienced beekeepers absolutely fail to find the (marked!) queen, even after multiple siftings of the hive. I think they should all wear jeweled collars, or little sparkly crowns! Storey’s Guide eh? I like the BBKA one but haven’t seen the Storey’s one, will have to check that out. Makes me feel better that other beekeepers struggle to find her too! Let’s petition Thornes to get into the sparkly crowns business!
. . . hamster-size bees would destroy my flowers . . . but, if it’s only the queen, I suppose it’s OK.
Ah yes, that could be dangerous! Insects were much bigger in the time of the dinosaurs, but then I guess the flowers must have been bigger too. I wonder how long our winter bees live in Australia. It’s often sunny and 20 C outside during the day with the hives buzzing with activity including orientation flights and certainly at least some pollen & nectar collection (our hives are getting heavier this winter, not lighter so stores are obviously being added to). We have things in flower all year and though it can get cold at night and sometimes stay too nasty and cold during the day for flight, most days the girls go to work. I guess what is in their favour for a bit of added life is that the days are shorter and since it gets cold overnight I’m guessing our girls only fly about 6 hours a day in mid-winter. Still, if the queen stopped laying in winter (she slows but I don’t think she ever stops) who knows what the population of a colony would be by spring. Have you ever read anything about life expectancy of bees when winters are mild and they forage all year? Hi Laura, good point that honey bees won’t stop foraging in all parts of the world. Because my books are aimed at readers living in colder climates I haven’t come across anything about the life expectancy of bees in milder winters. I suppose it would be more similar to summer bees at six weeks-ish if they are still foraging – but I’m only guessing. Having to raise brood would shorten their life too. My mother sends me copies of Edible Boston and I remember blogging about Orren Fox back in 2013 (see his article http://www.edibleboston.com/the-reason-i-keep-bees/). Glad to see he’s still a beekeeper! Nice article! I see his bee-suit looks in need of a wash – typical teenager! His love for the bees comes across as genuine. Never fails to amaze me that we can still be learning so much even after bee keeping all these years. Will be sure to get myself a copy of this book!